In his will of November 27, 1895, Alfred Nobel specified that the bulk of his estate should be deposited in a fund, the interest of which should be divided into five parts and to be used for Prizes in Physics, Chemistry, Literature and Peace. One of the five shares should be given to the person “who shall have made the most important discovery within the domain of Physiology or Medicine”. The Royal Caroline Medico-Surgical Institute in Stockholm, today Karolinska Institutet, was entrusted with the task of selecting the winners of the award. A portrait of Alfred Nobel in one of his laboratories. What motivated Alfred Nobel to specify a prize in physiology or medicine? Was it because of his own health problems or was he genuinely interested in scientific problems in these areas? 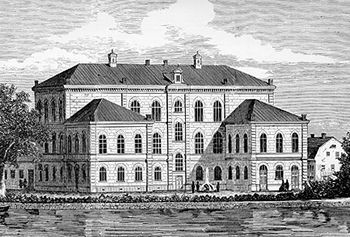 Why did he choose the Royal Caroline Medico-Surgical Institute at a time when there were older and more established medical faculties at the universities of Uppsala and Lund? Did he have personal contacts with the Institute? How did the Institute respond to the will and the task of awarding the Nobel Prize in Physiology or Medicine? Did he make any other donations to medical research? Explosions in his factories, sometimes with many casualties, the resulting bad publicity, as well as patent infringements and the legal procedures to protect his patents, added to his burden. The 80’s and early 90’s, was a period of frequent depressions but, in spite of this, he showed great tenacity and carried on with his work. Toward his final years, he was in a more cheerful mood and planned to reduce his personal engagement in business activity and to return to Sweden. Finally he suffered a stroke, was partly paralyzed, and died at San Remo at 2:00 a.m. on December 10, 1896. Alfred Nobel’s interest in physiology and medicine was genuinely scientific. In his laboratory notebooks, he often made notes about ideas that should be tested “to mitigate or cure disease”. He was interested in anaesthesia and listed substances and alcohols that might be useful for this purpose. He also contemplated intravenous injection of anaesthetic agents as an alternative to the ether and chloroform anaesthesia that was commonly used at his time. The discoverer of nitroglycerine, Ascanio Sobrero, had noted at that time, that exposure to this chemical may cause severe headaches. Alfred Nobel, who spent much of his time experimenting with this substance, must have had experienced this effect and later on, when nitroglycerine was produced at an industrial level, it is reasonable to assume that nitroglycerine was a serious medical and environmental problem, also for his collaborators. On the other hand, in some situations, nitroglycerine is useful in the treatment of disease. Lauder Brunton, a distinguished British physician, had found in 1867 that organic nitrates were effective in relieving pains in angina pectoris. When in 1890 Nobel’s physicians recommended nitroglycerine as a remedy for his heart disease he declined it. “The Legacy of Alfred Nobel,” by R. Sohlman, The Bodley Head Ltd, London, 1983. Nitroglycerin has now been used in the treatment of angina pectoris for more than 100 years without anyone knowing its physiological mechanism of action. Thanks to the work of Robert Furchgott, Louis Ignarro, and Ferid Murad, who share the 1998 Nobel Prize in Physiology or Medicine, we now know that nitroglycerin acts by releasing nitric oxide, NO, a common gas and environmental pollutant. The gas is released in the endothelial cell layer lining the interior surface of blood vessels. From there, it diffuses into the smooth muscle cell layer, triggering a relaxation of its myofilaments. As a result, the blood vessel widens allowing more blood to pass. The improved circulation means more oxygen for the heart muscle and the pain is reduced. To understand why many in the academic world were surprised when Alfred Nobel entrusted Karolinska Institutet with the task of selecting the prize winner in physiology or medicine, it is necessary to go back to the early history of the institute. The Carolinska Medico-Surgical Institute, as it was known at the time, was formed in 1810 by the merger of a small medical college and a trade school of surgery where barbers were trained to do amputations. Sweden had just lost a war against Russia, and there was a desperate need for army doctors. Academically, the Institute had not reached the status of the medical faculties at the Universities of Uppsala and Lund. When Alfred Nobel wrote his will in 1895 Karolinska Institutet did not yet have the rights to examine students in all medical subjects. Students had to go to Uppsala University to take some exams. Furthermore, the Institute was torn by internal conflicts, and some professors at Uppsala University recommended closing the Institute and concentrating all medical education at Uppsala. One aspect of the Institute which may have attracted Nobel, an applied chemist, was that thanks to its founding fathers, Jöns Jacob Berzelius and Anders Retzius, the training of doctors was based on natural sciences. Berzelius was a respected chemist who analyzed the composition of tissues and body liquids, a field which was then called “animal chemistry”, today known as biochemistry. Retzius, who taught anatomy, was also studying the cellular composition of tissues using a microscope. By contrast, the other medical faculties, were engaged in endless theological discussions of the relationship between disease and sin. Alfred Nobel had personal contacts with representatives of the Institute. One of them was Dr. Sten von Hofsten, a pediatrician and assistant professor at the Karolinska Institutet, who assisted in arranging a fund commemorating his mother. Hofsten was surprised at Alfred Nobels’ interest in biology and physiology, and they had long discussions on both subjects. In 1890, von Hofsten met with Alfred Nobel in Paris and found that the latter had a genuine interest in the medical sciences. Nobel expressed his wish to become acquainted with some young, well-trained Swedish physiologist with whom he could work, or rather who might be able to carry out some of the many original and ingenious ideas on the subject of physiology that were germinating in his highly inventive brain. Through the mediation of von Hofsten, Johan Erik (Jöns) Johansson was invited to work on blood transfusion at Alfred Nobel’s laboratory at Sevran outside Paris. Johansson accepted the invitation and spent 5 months in Sevran. In Alfred Nobel’s view, the main difficulties with blood transfusion was that blood changes very rapidly outside the body and that blood, therefore, had to be directly transferred from the donor to the recipient. Tubings made of molten borax and sodium were particularly suited for such transfers since they would cause minimum damage to the blood corpuscles. This, of course, was before the problem of blood groups had been solved and nothing came of these ideas. When Alfred Nobel’s will was opened in 1896, it was questioned by some of his relatives. Its exact wording was subjected to detailed analysis when the statutes of the Nobel Foundation were written. The Royal Caroline Medico-Surgical Institute was represented by its rector, Count Mörner. Within the faculty the opinion was divided. Some members hesitated in getting the Institute involved as long as the claims of the relatives had not been settled. Jöns Johansson, now professor at Karolinska Institutet, took an active part in the faculty work. Being the only person on the faculty who had worked with Alfred Nobel and knowing his interests in medicine, he played an important role in formulating the final rules. After some deliberations and compromises, “the domain of physiology or medicine” was understood to encompass the theoretical as well as the practical medical sciences. This left the prize-awarding institution considerable freedom in making its own interpretation. Over the years, awards have been made both to the theoretical and preclinical sciences, as well as to clinical medicine. In fact, the interpretation has been liberal and has included topics ranging from behavioral sciences to plant genetics. The Royal Caroline Medico-Surgical Institute at Hantverkargatan in Stockholm. Alfred Nobel also supported medical research in Russia where he grew up and studied with private tutors. Some time around 1894 the Russian physiologist I.P. Pavlov and M. Nencki, professor of medical chemistry at St.Petersburg received financial support for their experimental work. * Nils Ringertz was born in 1932. He got an MD/PhD in medicine in 1960 and specialized in medical cell genetics. His main line of research has been nucleocytoplasmic signaling and digital imaging of cell structures using fluorescent probes. Nils Ringertz served as professor of medical cell genetics at Karolinska Institutet, Stockholm in 1969-1993, was chairman at the Department of Cell and Molecular Biology (CMB) of the Medical Nobel Institute in 1977-1993, and chairman of the Medical Nobel Committee 1976-1999. From 1963 to 1993 he was editor of Experimental Cell Research (Academic Press). Nils Ringertz was a member of the Royal Swedish Academy of Sciences and served with a number of international scientific organizations. In 1994 he initiated the Electronic Nobel Museum Project (ENM) which led to the Nobelprize.org (NeM). Nils Ringertz died in his home in Stockholm on June 8, 2002.